TV on Blu-ray: "The Venture Bros.: Season 5"
Animation’s most hapless family returns. The biggest advantage an animated series has is its immunity to the passage of time. Actors may age, but their animated counterparts don’t: Bart Simpson is well into his third decade in the fourth grade, and Stewie Griffin can travel back in time and encounter himself as he was ten years ago, but he’ll still never be potty trained. It says something for the ambition of The Venture Bros. and its writers, Doc Hammer and Jackson Publick, that not only do its characters age, but that their aging is the engine that propels the show and keeps it constantly renewing itself. Reviewing a season of most animated series is mostly a matter of noting minor shifts in tone or style within a premise that never changes. Venture Bros. seasons blast forward like a rocket-powered car, ending far from where they began and leaving a trail of dust, smoke and plot wreckage in their wake, and the fifth season, now available on DVD and Blu-ray, is no exception. The primary change underpinning the show’s fifth season is the evolution of the titular Venture Brothers, Hank and Dean, from dorky, wide-eyed walking lab rats into young men escaping their father’s gangly shadow to establish their own identities. Dean learns he and his brothers are clones (in “A Very Venture Halloween,” planned as the fourth episode of the season but shown out of sequence and included as a special feature on this set) and goes dark, dying his hair black, donning a jet-black Venture speedsuit and basically turning into Darlene Conner, minus the curls. (Sgt. Hatred tries to intervene, convinced that Dean is either cutting himself or anorexic.) But it’s Hank who elevates the season to its best comic heights, embracing his inner hero in the otherwise spotty “Venture Libre” and bringing considerable panache to “Momma’s Boys,” an episode that adds yet another demented twist to the brothers’ origin story. The heart of the show is still Dr. Venture himself, and in a show that has changed at a breakneck pace, his dyspeptic feud with the Monarch, whose hatred for Venture is making him increasingly unhinged, is the one constant. Rusty is on the periphery through much of the season, reacting to events rather than driving them (although his showcase episode “Spanakopita!”, in which the residents of a tiny Greek island come together to take him to the cleaners every summer, is possibly my favorite of the batch). That’s pretty much as it should be. Rusty’s father, the larger than life Jonas Venture, was a doer extraordinaire (if a lousy father); by contrast, his son shuffles through life exerting a minimum of effort, waiting for the rewards (not all of them material) he feels his life as a boy adventurer entitled him to but which he never got. Rusty quite literally blunders into the action in “Bot Seeks Bot” and ends up crushed under a giant mirror ball. The denouement to this setup, the season-ending “The Devil’s Grip,” combines hijinks with the original Team Venture — I will laugh at pretty much anything Colonel Gentleman does — with yet another confrontation between Rusty and his arch-foe. Primed to torture Venture to his (the Monarch’s) heart’s content, the Monarch finds that the reality of having his enemy at his mercy comes nowhere near the scene he imagines. Supervillain/captor and captive/nebbish end up having a heart-to-heart that ends with the Monarch letting Dr. Venture go … and contemplating a photograph with the potential to finally shift the relationship between the two men. In addition to the aforementioned Halloween episode, bonus features on this set include commentaries with Doc Hammer and Jackson Publick on every episode, and a Behind the Music-style featurette on Shallow Gravy, the band formed by Hank and doofus half-brother Dermott. There’s also some deleted scenes and leftover audio. 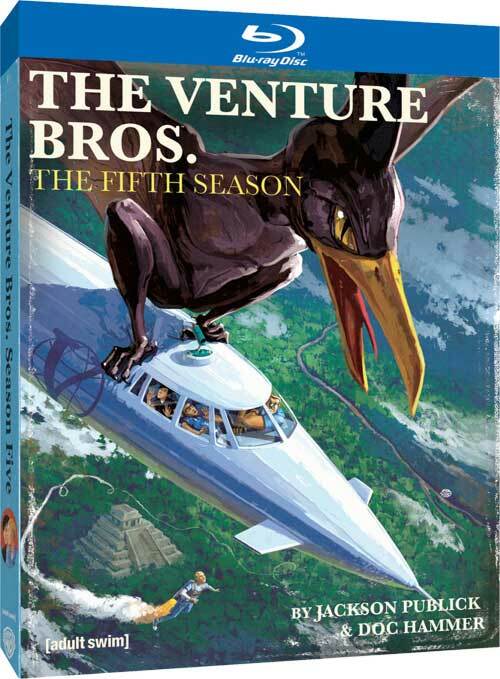 And special mention must be made of the packaging: Venture Bros. DVDs always have wittier-than-usual packaging, and this season’s box is designed as an installment in a Stratemeyer book series, complete with endpapers and fake cloth covers. The Venture Bros. Season Five finds one of TV’s funniest, richest animated shows continuing at the top of its game, with no signs of slowing down.